The Vancouver Convention & Exhibition Centre expansion project is expected to generate 6,700 construction jobs. B.C. taxpayers will be liable for any cost overruns that occur during the $565 million Vancouver convention centre expansion project, Small Business and Economic Development Minister John Les confirmed Friday. He stressed no one expects the project to run over budget, but if it does the province will have to cough up the extra funds. “We’d be responsible, no question about that,” Les said in an interview. 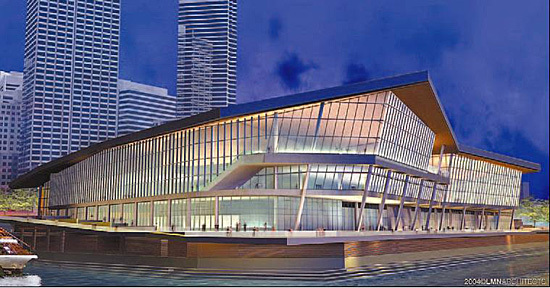 The federal and provincial governments have each committed $222.5 million for the new convention centre, with the tourism industry providing $90 million and convention centre leasing and vendor agreements kicking in another $30 million. Les said the budget has a contingency fund of about $70 million to cover any unforeseen costs and if project officials see cost pressures on the horizon, they will have to deal with them in the context of a maximum budget of $565 million. A few North American convention centres, including the Telus Whistler Conference Centre, have raised money by selling their facility name to corporations. But Vancouver Convention & Exhibition Centre general manager Barbara Maple said the expanded Vancouver facility is unlikely to carry a corporate name like the Visa Vancouver Convention centre or the IBM Vancouver Convention Centre. The expansion project on the west side of the existing convention centre at Canada Place will more than triple the facility’s 12,400 metres of function space by adding another 35,470 metres of space when completed by the summer of 2008. The project, which officially began late last year, is expected to generate 6,700 construction jobs during the four-year building phase and support another 7,500 jobs after it’s finished. Russ Anthony, president of Vancouver Convention Centre Expansion Project Ltd., said about $34 million worth of contract work has been awarded on the project since last summer. The two biggest recipients so far are Vancouver Pile Driving, which will get $14.3 million for winning five separate contracts, and Marubeni-Itochu Steel of Japan, which is getting $11 million for supplying more than 1,000 steel piles. The contracts awarded so far mainly involve excavation, drilling and soil densification on the unique building site that’s a combination of water and landfill. Site preparation work and pile-driving activity will continue throughout the rest of this year before steel columns begin to emerge from a foundation by March 2006. PCL Construction is the general contractor for the project but the total value of its contract will not be determined until later in the project, after the water phase is completed in about a year. Anthony said another $45 million worth of contracts will be awarded over the next two months for pre-cast concrete, viaduct construction, exterior glazing and elevators and escalators. He said the bidding process for work on the project has been extremely competitive and noted several smaller firms have joined together on certain bids so they can compete effectively against larger companies. “If this becomes an instrument of getting our local industries to work together to go after the larger contracts, then that’s a great thing for the business community,” Anthony said. Telus Whistler Conference Centre, have raised money by selling their facility name to corporations. But Vancouver Convention & Exhibition Centre general manager Barbara Maple said the expanded Vancouver facility is unlikely to carry a corporate name like the Visa Vancouver Convention centre or the IBM Vancouver Convention Centre. Vancouver Pile Driving: $14.3 million for site preparation, pile-driving and offshore dredging, filling and ground improvement. Marubeni-Itochu Steel (Japan): $11 million for more than 1,000 one-metre-diameter steel piles. Hayward Baker (Washington state): $4 million for onshore site stabilization work. $2 million for civic construction work. Southwest Contracting (Surrey): $800,000 for excavation work. City Fido to ‘burbs’: you’re out . Once touted as a wireless home phone replacement for all Lower Mainlanders, City Fido is hanging up on most of the suburbs and abandoning its unlimited calling plan. 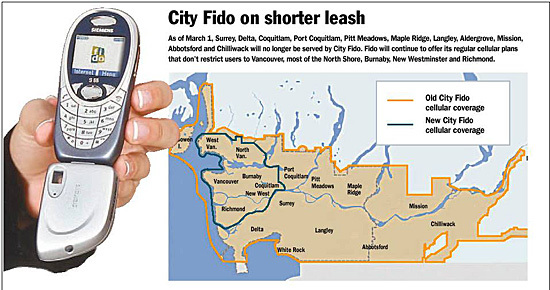 As of March 1, Surrey, Delta, Coquitlam, Port Coquitlam, Pitt Meadows, Maple Ridge, Langley, Aldergrove, Mission, Abbotsford and Chilliwack will no longer be served by City Fido. New users of City Fido — now a part of Rogers Wireless — will charge new customers $45 a month for 750 anytime minutes or $65 a month for 1,500 minutes. And if they leave the central coverage area they’ll have to pay 50 cents a minute extra on top of any long-distance charges. Established customers with contracts will continue to get the old rates and service area for as long as they renew their contracts. And Fido will continue to offer its regular cellular plans that don’t restrict users to the Vancouver core including the North Shore, Vancouver, Burnaby, New Westminster and Richmond. Fido president Alain Reaume, who is also an executive vice-president with Rogers, disagreed, saying in an interview that City Fido would now go from being a mass market to a niche product, aimed at young urbanites who rarely venture outside the city core. Reaume said that while City Fido worked well for his old company Microcell — since purchased by Rogers — it wasn’t economical for a larger player to continue the service. “And as an executive vice-president for Rogers I have to take that into account now,” said Reaume. Angus said that with the purchase of Microcell by Rogers — which intends to enter the home phone market with Internet telephones — Canada now has three cellular carriers who don’t want to compete with wireline phone rates or service. He added that cellular is in danger of becoming an expensive side service rather than a potentially direct competitor for land-line phones. Another Toronto telephone analyst, Brian Sharwood, a principal of the SeaBoard Group, said the only hope Canadians might have for lower cellular rates might lie now with Virgin Mobile Canada, which will be entering the market this year using Bell Canada‘s network. Angus, however, disagreed, saying that Virgin’s market was primarily the prepaid youth market and that, in any case, they are owned 50 per cent by Bell. Posted in Other News Articles | Comments Off on City Fido to ‘burbs’: you’re out . 1) CANON POWERSHOT A510, $375. Small and light and sporting 3.2 megapixel capability, the A510 is designed to introduce its users to the concept of digital photography. It comes equipped with a 4x optical zoom lens that offers a 35 to 140mm range (35 mm format equivalent.) Despite its size, this replacement for Canon’s popular A75, has a 1.8-inch LCD screen. It uses only two AA batteries for 300 shots with the screen on, as opposed to four in previous models. Two new settings called Night Snapshot and Kids & Pets have been added. 2) ONKYO TX – NR1000 THX ULTRA 2 NETWORK HOME THEATRE RECEIVER, $4,300. Onkyo is pushing its top-of-the-line, cutting-edge new home theatre receiver as being what it terms “future proof.” In other words, it comes with plug-in circuit modules, which means that every time there’s a must-have update in technology, early-adopter owners will be able to replace a card rather than the entire receiver. As well, Onkyo says it will offer software upgrades as necessary to go along with the technology. The seven-channel (150 watts each) receiver can be connected via ethernet to a home computer network. 3) KONICA MINOLTA DIMAGE Z5, NO PRICE AVAILABLE YET. Aimed at the travel and home photography market, this just-announced five-megapixel digital camera from Konica Minolta comes with a 12x optical zoom lens with a 35mm camera equivalent of 35-420 mm (especially good for sporting events). It also features the company’s proprietary anti-vibration technology that helps halt that blurring problem that a lot of amateurs see when they try to shoot at slower shutter speeds because of lower light levels. Has a two-inch LCD monitor and can focus at 0.2 seconds at wide angle and 0.3 seconds at telephoto. 4) TOSHIBA PORTEGE M300 NOTEBOOK COMPUTER, $2,600. Weighing just 3.6 pounds, this notebook is described by Toshiba as being ultra portable. It features built-in protection that stops the 60 gigabyte hard drive from being read should the notebook be dropped. It also has a spill-resistant keyboard. The M300 features a 12.1-inch screen and an Intel Pentium M processor, 512 megabytes of DDR memory and up to six hours of battery life. It also has a combo CDRW/DVD drive that allows DVD viewing and data burning to CD. A unexpectedly successful condominium sale in Burnaby last weekend indicated there’s a demand for high-end highrise living outside the downtown core. By the end of its first day of marketing the Encore Lifestyles Residences near Lougheed Mall on Saturday, the Executive Group had sold more than 85 per cent of the 170-suite building. Prospective buyers lined up to get into the presentation centre and display suite at the site on North Road. “I expected a lot of pent-up demand, but I didn’t expect a line-up,” said Executive Group president Salim Sayani. Some of the suites had been sold the previous week in a “VIP” offering to pre-registrants. The company, which develops housing and owns the 17-hotel Executive Hotels & Resorts chain, is building the 18-storey tower adjacent to its Executive Plaza Hotel, completed in 1998. Similar to hotel-residences built or planned for downtown Vancouver such as the upcoming Shangri-La Hotel, the project offers strata buyers access to the hotel’s amenities, from the pool and tennis courts to maid service, valet parking and in-suite catering. The condo tower itself will also feature a yoga/pilates studio, theatre, fitness facility and strata commercial space. The units range from 640-square-foot, one-bedroom condos (starting at $169,000) to 1,450-square-foot, ground-level townhouses for $369,000. Larger penthouse suites were also available for up to $700,000. Sayani estimated investors represented between 35 and 40 per cent of buyers, with the remainder split between young couples and older “empty nesters” planning to occupy the suites themselves. The developer opted for the luxury format to differentiate the project from the large number of towers going up in the nearby Brentwood area targeted at first-time buyers. The Executive Group had successfully marketed luxury units downtown and near the airport in the past, Sayani added. But there remained the question of whether the format would work in a traditionally blue-collar suburb like Burnaby. “I think we hit the mark,” Sayani said. Independent housing analyst Michael Ferreira of Urban Analytics Inc. agreed that Encore is the first luxury tower of its kind outside Vancouver and Richmond, and believes there may be room for similar projects in North Vancouver and even Surrey. But he cautioned against builders and investors rushing to copy the Executive Group’s model. “I don’t think the market is deep for that kind of thing,” he said. SAN FRANCISCO — Google Inc. is using its popular Internet search technology to find information and images broadcast on television, continuing a recent effort to extend its reach beyond the web. The California-based company planned to introduce the new video search service today in an index that will be operated separately from the market-leading search engine offered on its home page. The feature pinpoints content previously aired on a variety of television networks by scanning through the closed-caption text that many programmers offer. Google’s index, which began storing information last month, includes programming from ABC, PBS, Fox News and C-SPAN. The television product represents Google’s latest attempt to get a better handle on the reams of vital information that isn’t stored on web pages. The company recently set out to scan millions of books from several major libraries into its search engine and is offering a program that finds material stored on computer hard drives. Search engine analyst Charlene Li of Forrester Research said Google’s latest innovation is likely to disappoint many people because it doesn’t provide a direct link to watch the previously broadcast programming. Google instead is displaying up to five still video images from the indexed television programs, as well as snippets from the show’s narrative. The search results also will provide a breakdown on when the program aired and when an episode is scheduled to be repeated. Local programming information will be available for those who provide a ZIP code. Rival search engine Yahoo Inc. also has been tinkering with a product that finds video available for Webcasts. Hoping to counter Google’s entrance into the space, Yahoo planned to step up the promotion of its video search tools Tuesday by linking to the service from the home page of its heavily trafficked website. Google doesn’t plan to use the television search engine as another vehicle for displaying the text-based ad links that generate most of its profits. CREDIT: Wayne Leidenfrost, The Province Russ Anthony, president of the Vancouver Convention Centre Expansion Project Ltd., is overseeing the massive, $565-million expansion project. The stabilization and pile-driving work at Vancouver‘s new convention centre on the waterfront is yielding glimpses of the city’s past. As workers start the year-long program of driving in densification columns, they are discovering they are only the latest human hands to have worked the 8.5-hectare water and land location. The total site encompasses the equivalent of four city blocks or 102,600 square metres. “We haven’t dug up a locomotive yet — for decades it was a marshalling yard and literally the end of the line for CP Rail — but we have had some surprises,” said Russ Anthony, President of the Vancouver Convention Centre Expansion Project Ltd. overseeing the massive $565-million project. “So far, we have discovered an old sea wall and various huge bits of old concrete highway and sidewalks that were dumped there over the years,” he says. He is confident the 68,000-square-metre centre will be brought in on time and on budget. Nevertheless, Anthony admits he will be very happy when “we get out of the water” and start actual building construction. That process, which involves a small army of heavy machinery and at least four pile-driving units, will be finished by the end of this year. “We are one of the first major projects in the ground ahead of RAV and other Winter Olympic projects, which is a help,” he said. He says the project, which is due for completion in 2008, will provide about 6,700 person-years of employment during the construction stage with another 7,500 full-time jobs when operating. The building will be low-rise, and its core will only be seven storeys high. It will be unique in that it will be environmentally friendly and use B.C. lumber and glazing as structural components along with steel and concrete. The final design of architects Downs Archambault Architects, Musson Cattell Mackey Partnership of Vancouver and LMN of Seattle, is expected to get the city’s OK by the end of the summer. “While the overall design is done, we are still discussing with the city what enhancements it would like to see incorporated. “We have a responsibility to maximize the public benefit,” Anthony said. The building’s “sustainable design,” which includes a 2.4-hectare “living roof,” internal water-filtering system and minimal impact on the environment, is intended to showcase the design, planning and construction skills of British Columbians to the world. “This building is going to be home to 10,000 media during the Olympics and going to be one of the most photographed buildings in the world. “Such exposure could be worth millions of dollars and showcase our skills to the world,” he said. It will be one of the most innovative meeting centres in the world. For instance, Anthony says the planted roof, complete with native West Coast plants, not only reduces internal heating costs but will provide water for various uses, such as toilets, after it is treated on site. “We will capture the rain run-off . . . and clarify it with a small on-site filtration plant for use in washrooms, etc. It means we will be much more self-contained and, apart from drinking water, we will be out of the supply loop,” he says. The same innovative, environmentally friendly thinking has gone into virtually every other aspect of the operation, even down to the non-chemical carpets. Despite a tripling of meeting space, the city is not trying to rival Las Vegas or Los Angeles or any other mega-meeting-place cities. Rather, it intends to play to its strength of catering for 100,000-square-foot conventions. Tourism Vancouver and the Vancouver Convention and Exhibition Centre — which will very likely operate the new centre — have already done a great job in attracting such conventions to Vancouver and the province, Anthony says. The city already garners a larger percentage of international conventions than other competitors in North America. “There will be large conventions from time to time, but the majority of it will be the smaller meetings that are the bread and butter. The jam of this is it will allow us to run three small conventions at the same time. If you can rotate conventions you can greatly reduce your downtime and that greatly increases values,” he said. Dimensions: 102,600 square metres. Sixty per cent will be built on land with the remainder over water. Partners: The federal and provincial governments will each provide $222. 5 million, the tourism industry/private sector will provide $90 million, and $30 will come from other revenue sources. Operator: The Vancouver Convention & Exhibition Centre. (B.C. Pavilion Corporation, a Crown corporation) is the current centre operator and that is expected to continue. The new centre will be owned by the province. Builder: The project is being overseen by the Vancouver Convention Centre Expansion Project Ltd., a company created specifically for the project. Construction : Construction is now under way. Thousands of stabilization piles. Completion is set for 2008. Economic Benefits: The project is expected to generate some $1.5 billion in economic benefits to industry as well as 6,700 person-years of employment during construction. An additional 7,500 full-time jobs will be created once operating. Existing Centre: The 32,000-square-metre convention centre will be renovated and linked to the new centre by a 90-metre connector to form an integrated centre. Delegates: Doubles from 2,500 to 5,000, with number of delegate days increasing to 630,000 annually from 390,000. Reason 271,152 to go to Granville Market: Your new home in Vancouver‘s Fairview neighbourhood comes with $23,000 worth of stainless appliances worthy of the finest and freshest ingredients the market’s merchants can stock. Reason 271,153 to take the Aquabus to Granville Market: Your new home is a few minutes’ stroll from one of the False Creek water taxi’s stops, at Stamp’s Landing. The Bohemia project literature promises the project, located on the south side of West Sixth between Ash and Heather streets, ”is all about possibility.” No arguing that. Because you can, you could, from one of the 44 Bohemia residences . . .
* Walk to market along the seawall rather than take an Aquabus (but take the water taxi back to Stamp’s Landing, that evening’s meal in the pack on your back). * Walk to the new Save-On-Foods or expanded Canadian Tire being built on Cambie. * Walk to Science World or, eventually, the Olympic Village or RAV station. Because you can, you could also stay at home, and . . .
* Polish up all that stainless, not forgetting the door and drawer handles and pulls, which are also finished in stainless. * Look at yourself in the granite countertops. * Order in. You’ve got your own separate entrance, nothing to confuse drivers or amuse the neighbours. Bohemia buyers Lorenzo and Sandra Iameo may never experience any of the above first hand. But their tenants certainly will and their sons might, two-year-old Spencer and six-month-old Mitchell. Harp Hoonjan, of Bohemia Developments Ltd., would be delighted to hear the contribution of the Bohemia builder to the Iameo decision to buy at Bohemia. ”Vanbots has a rock solid reputation as a construction company,” Lorenzo reports. With operations on two continents managed from head office in Markham, Ont., 45-year-old Vanbots Construction is an important component of the Bohemia marketing mix. ”The industry is busy, the trades are busy. It’s not like you can phone them up anymore and they’re there, at your doorstep, wanting to do the work,” Hoonjan says of the importance of Vanbots to the project. For Michael Sikich of D’Ovidio Sikich, Bohemia‘s project marketer, the builder makes Bohemia stand out because it signals a commitment to the integrity of the seller-buyer arrangement that is bigger than the provincial Homeowner Protection Act. ”Everybody talks about warranty. Everybody has to have the warranty,” he notes. ”But it’s more than just that. You may have the warranty which is fine. But if you have problems later you still have the problems, the inconvenience of having to have things corrected and changed down the road. Residential entrances always matter, but accrue special importance when they’re the primary opening between the private space and the public space that is dominated by a busy throughroad like West Sixth Avenue between Hemlock and Cambie streets. At Bohemia, the entrances to half of the 28 residences along West Sixth are located in a courtyard to be located between the development’s lane buildings and its street buildings (below). The entrances to the other half, on West Sixth, are tucked away behind a building extension and under an upper level (bottom). To take the edge off the noise generated by the passing traffic, the framing on the West Sixth exterior walls will also be deeper than the framing on the other exteriors, Harp Hoonjan promises. The insulation, accordingly, will be thicker and the space between panes in the double-glazing will be deeper. “Sound is not an element for our project,” he vows. The immediate views of West Sixth from the residences will be softened by a new grassed and tree lined boulevard. This neighbourhood amenity helped the developer “achieve,” at city hall, the maximum allowable density on this site. Centre hours: M-Th, 1 p.m. – 6 p.m.; Fri closed; Sa and Su, 12 p.m. – 5 p.m. The launch of a new housing development project on Robson Street in downtown Vancouver recently drew special attention because the project will combine in the same complex 46 non-market rental units for low-income tenants with high-end condominium housing (”Well-heeled and homeless to cohabit,” Monday’s Vancouver Sun, page B5). This isn’t the first time that social housing has been built alongside market housing. In fact, the development that has transformed Coal Harbour over the last few years successfully integrated non-market housing with luxury housing. Walking through the neighbourhood, it is almost impossible to distinguish between the two. This housing integration encourages the kind of social interaction that builds healthy, resourceful neighbourhoods where people help each other. These neighbourhoods are the antithesis of the kind of neighbourhood that has been created in the downtown eastside, where a concentration of too much social housing and a lack of non-market housing has resulted in a neighbourhood that does little more than warehouse the lesser advantaged. There are approximately 29,000 non-market housing units in British Columbia, 21,000 of them in the city of Vancouver. Almost 10 per cent of the city’s housing stock is non-market housing. The experts tell us that in B.C. there is a waiting list with nearly 10,000 households on it. That means that about two per cent of the households in B.C. can’t afford to pay the going rates for shelter. Social housing advocates will tell you that governments simply need to spend more money financing non-profit organizations to build subsidized non-market housing. Lots more. I believe the answer is a lot more complex than that. There will always be a certain number of people who can’t afford shelter, regardless of the current state of the housing market and government needs to help them. Particular sub-markets in our boom and bust economy will always be influenced by economic pressures only government intervention can relieve. For example, resort communities like Whistler that become international destinations and have a limited land base will always have a difficult time meeting the housing affordability challenge for people who need to live and work in the community. But government subsidies for housing are only one solution to the housing affordability challenge. Another solution is for governments to take back some of the cost burden they impose on the cost of building market housing. Governments need to control their urge to tax new homeowners with hidden charges. Housing has become any easy target for hidden taxes. It is a big ticket item. When the market is booming, there’s hardly a whimper when a two- or- three-thousand dollar government charge gets passed on to the consumer in the form of an increase in the selling price. Today, through direct charges on the cost of development, new homeowners pay for everything from the cost of new infrastructure needed to service new housing developments to public art, child care and, believe it or not, social housing. Often governments call these contributions “voluntary,” urging developers to pay them when government officials are exercising their discretion at the approval stage for a developer’s project. The wish list of civic governments grows every day. In rising markets, like the one we’ve just experienced, the appetite is almost insatiable. Remember the RAV project? We were told that senior governments committed billions to this new badly needed transit project and, with a unique public/private partnership, residents in Richmond and Vancouver wouldn’t directly pay a dime for their new transit line. Lo and behold, in Richmond developers are now being asked to “voluntarily contribute” to a RAV fund up to $4 per square foot for every square foot of new housing they build in that city’s town centre. It’s not a tax or a charge, according to the City. It’s a “voluntary contribution” to fund capital works that help to better integrate RAV into the community. Tell that to the homeowner in search of an affordable home who will be paying upwards of $4,000 towards the Richmond-Airport-Vancouver rapid transit project when they buy a new condo in Richmond‘s city centre. Vancouver Sun reporter Wyng Chow destroyed his own integrity and put the newspaper’s credibility in jeopardy by accepting a benefit from a developer he was covering as a real estate reporter, the Sun’s lawyer said Friday. In a final argument before arbitrator Rory McDonald, Donald Jordan said Chow, 56, crossed the line when he mixed a personal dispute with Concord Pacific Ltd. with his job as a business reporter. And he said Chow’s acceptance of a “deep discount” on a condominium he bought from the company in 2001 showed a “lack of a moral compass” that justified the newspaper firing him last month. But Carolyn Askew, who is representing Chow and the Communications, Energy and Paperworkers Union of Canada, of which he is a member, said in her summation that Chow did nothing wrong in trying to resolve a long-standing complaint he had with Concord Pacific as a legitimate, but unhappy customer of one of their condominium units. The anonymous tipster complained that the newspaper was overly positive in reporting on real estate matters, and accused it of tailoring coverage to drive advertisers to its Homes section. The tipster named Chow as an example of what was wrong with the newspaper’s business coverage. Askew said the newspaper’s decision “deflected the criticism of the paper on to Chow” and that no other reporters or the newspaper’s own culpability were investigated. “Patricia Graham totally ignored the substance of the complaint — that the entire Vancouver Sun is pro-development industry,” she said. But Jordan said such an allegation was preposterous. Chow was the only person named by the tipster, and the paper owed a duty to investigate. At issue is whether Chow could have been perceived to be in a conflict-of-interest for accepting a $39,000 discount from Concord Pacific on a $308,000, 19th-floor condominium in the Waterford project. 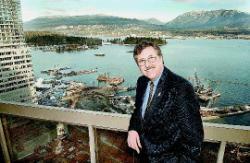 At the time, he was writing as the Sun’s real estate reporter and frequently quoted Concord Pacific officials. Graham fired Chow in December after the paper conducted an investigation and discovered he had paid a below-market price for the condominium. The union is seeking full reinstatement; the company is asking McDonald to uphold Chow’s dismissal. Chow said the deal was a settlement for his complaint that the floorplan of a townhouse he bought from Concord in 1995 was altered without his authority. There was testimony that in 1997, Concord adjusted the price by about $15,000 to reflect the altered floor plan. Jordan said this adjustment resolved Chow’s complaint, and that the further discount on the later unit could not be justified. Askew said both Chow and Henry Man, Concord‘s former chief operating officer, felt a price reduction on the Waterford condo was necessary and fair, and that the newspaper couldn’t suggest otherwise. She also reminded McDonald that the paper has no written code of conduct. In the absence of written policies, which some other print and broadcast media have, the newspaper can’t fairly accuse reporters of not adhering to a strict standard, she said. And she pointed out that the newspaper wasn’t alleging Chow was biased in his reporting. But Jordan told McDonald there are three universal concepts of ethics in journalism that every reporter understands: It is wrong to make up things, to claim other peoples’ work as your own, and to accept money or benefits from people you cover. If Chow had a difficulty with Concord Pacific as a customer, he should have disclosed it, Jordan said. But it wasn’t until after the tip was made that the company learned of the situation. McDonald reserved judgment and said he would rule within 10 days. Hani Lammam (above) is the Cressy Development executive managing the four-tower Hamptons Park project in Richmond. Fifteen years ago an “amenity centre” in a condominium project basically meant the place had an extra room in the basement for social gatherings or maybe a pool if you were lucky. But today, the centre is more like a luxury club, boasting such features as a pool, hot tub, steam and sauna room, party room with full kitchen, yoga and pilates studio, a billiards lounge, outdoor barbecue, private theatre and, in the one recent Vancouver development, a fleet of kayaks and two 10-pin bowling alleys. In some municipalities these clubs or amenity centres are actually a requirement by city officials who fear the increase in population from large developments will put too much of a strain on city amenities. “In Richmond if you don’t provide an amenity centre they will charge you a levy,” says Michael Ferreira, president of Urban Analytics, a research and consulting company specializing in the new home market. But Ferreira noted despite the controversy, in many cases developers are happy to offer amenity centres or clubs because they appeal to their target market. “They (clubs) can add value to a development. The advantage is they provide a meeting place for residents. Even though you live close you often don’t see a lot of people. They help give a development more of a community feel,” he said. For instance, in downtown Vancouver it was noticed that more and more families with children were buying high-rise apartments and families said they wanted more space available to them in the building. The solution for some developments was expanding the family room. “Having a parent room is great to take a child to burn off steam outside the unit,” said MAC Real Estate Solutions co-owner Cameron McNeill, who added an amenity package could be as simple as a television lounge to a full spa-like resort. But both McNeill and Ferreira say developers are being careful to be cost-effective with any club they build to ensure it remains cost-effective as far as monthly maintenance fees go. McNeill estimates maintenance fees can range from $90 for a 400-square-foot studio to $300 or more for the more luxurious downtown units. Ferreira advises anyone buying into a project with a club ensure they are comfortable with the monthly fee and consider what will happen as the project ages. The 5,000-square-foot clubhouse at Langley’s Sagebrook development includes a billiard table, fireplace, kitchen and exercise room. “Ask as the project ages will the maintenance cost increase as well?” he said. They noted some developers targeting the budget-conscious buyer solve this problem by not putting pools into the project because they are more costly to maintain, or they build an outdoor pool, which doesn’t require year-round maintenance. He noted the Tandem project in Burnaby, now under construction by Anthem Properties, is a good example where first-time home buyers living in two towers will share an amenity building in the middle of the towers. This club does not have a pool. “The buyers were budget conscious and they liked this building offered a lifestyle. They will have a full spa, gym, sauna, hot tub, a big party room with a large screen TV, and leather couches. It feels like a sports bar,” said McNeill, adding without the pool the monthly maintenance fees are affordable, ranging from $120 to $200. Vancouver resident France Stewart and her husband Alexander take possession next month of a condo in the 32-storey Park West project by Concord Pacific, which overlooks Granville Island. Residents of Park West and three other nearby towers that Concord built around the new George Wainborn Park will have access to Club Viva, a 70,000-square-foot full-amenity building. “It would be impossible for just one highrise to afford it but this way the (maintenance) cost is shared and it provides a luxury,” said Stewart. She said the club has a large pool, a “spectacular” gym, a party room, two theatre rooms and a library. “Clubs are really important for resale. That’s what people are looking for,” she said. She added having a club on site also gets people out of their cars and enjoying a quality lifestyle without having to stray far from home. This was certainly the appeal for buyers of Sagebrook, a Polygon development in Langley that was geared toward first time buyers. There a 5,000-square-foot resort-style clubhouse will provide residents a space with a large, high-ceiling guest room as well as a billiards table and stone fireplace. There’s a fully equipped kitchen and an exercise room as well. Another new development that offers two full clubhouses to be shared by four towers is Hamptons Park by Cressy Development in Richmond. Both club houses have indoor pools surrounded by windows to let in the full light, his and her saunas, a billiard rooms and outdoor barbecues that can be booked by owners whenever they are entertaining. “We see the value of providing this type of amenity in major developments,” said Cressy vice-president Hani Lammam. Lammam said a project would need at least 200 units for it to be worthwhile to build a clubhouse. He added a larger project allows the maintenance costs to be shared by more owners, making it more cost effective. You are currently browsing the Les Twarog Vancouver Real Estate and Condo Blog blog archives for January, 2005.